1. This machine integrates the functions of bag making, sealing, slitting, punching and printing to ensure secure bag seal and nice appearance. The parts of the machine in contact with the material are all made of 304 stainless steel to ensure food safety. 2. 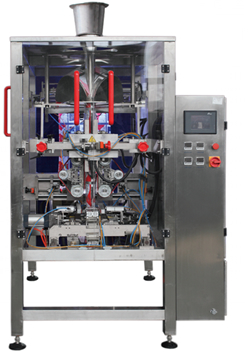 This machine adopts splint type film pulling to ensure uniform stress of packaging materials suffered during the operation, the packaging material is not easy to deform and deviate, the bag shape is beautiful and stereoscopic, servo motor is adopted to ensure stable bag length during the packaging. 3. This machine has the characteristics of stable running, simple operation, concise structure, beautiful appearance and convenient cleaning and maintenance. Application︰ Seeds, almonds, pecans and other roasted food.